Life Sciences doctoral candidate and environmental activist, Ms Refilwe Mofokeng, organised a clean-up at the Durban Harbour, with the support of the School of Life Sciences and African Marine Solutions (AMSOL), as part of the annual International Coastal Clean-Up Day. A highlight of the day was the participation of children from Girls and Boys Town (GBT), a residence for vulnerable children. UKZN postgraduate students in Marine Biology, under the supervision of Dr David Glassom and Professor Ursula Scharler, took part and guided the children in a task that involved them presenting their ideas about how to save and preserve the marine environment. AMSOL provided the children who participated with closed shoes, toys and meals on the day. The day’s clean-up activities involved separation of waste into plastic, paper and other litter; with the team collecting more than 100 bags. Mofokeng said that as usual, plastic made up the bulk of the litter. Mofokeng thanked AMSOL for their support and also the UKZN Dean and Head of the School of Life Sciences, Professor Ademola Olaniran, for his support in providing transport for students from the Pietermaritzburg campus to enable them to participate. The event was preceded by a visit to GBT in Glenwood where Mofokeng and Marine Biology Master’s candidate Ms Amy Shurety gave presentations about environmental health and marine biodiversity and inspired children to think about how threats to the environment such as pollution could be tackled. Olaniran supported the presentation at GBT by providing stationery and artwork to help in the presentations. The Natal Sharks Board was also at the presentation to do a shark dissection. ‘It was an excellent presentation and the children were captivated by it all,’ said GBT staff in a statement thanking the presenters. These are not the first events for Mofokeng and her team this year. 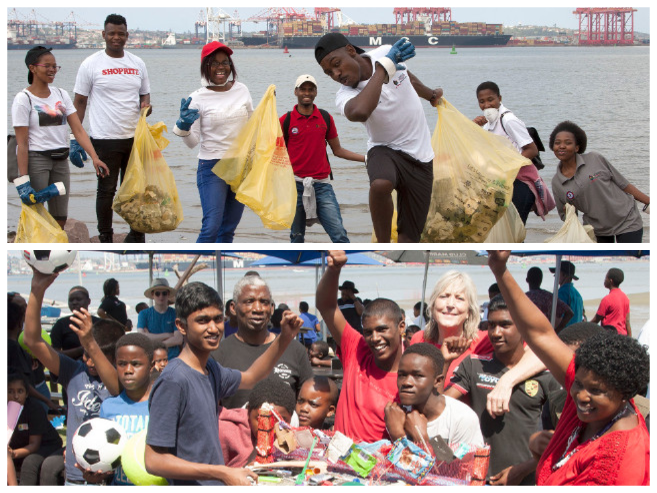 In June, the team held a successful recycling awareness drive on the UKZN Westville campus and a Durban Harbour clean up to coincide with World Oceans Day. These events are held under the auspices of the Refilwe Matlotlo non-profit organisation known as Refilwe Matlotlo #GetInvolved established by Mofokeng to help educate people about environmental conservation and litter reduction. The clean-up events also measure the effects of pollution on marine life, assists with school food gardens and gives motivational talks.